Caused by the fungus Sclerotium rolfsii.Distinguishing sign is white mold, often with “seedlike”sclerotia, present on the infected stem near the soil line. 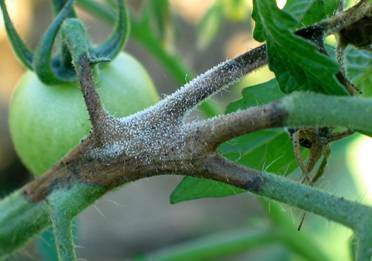 This fungus also causes rot of tomato and other plant parts in contact with soil. The fungus lives in the soil for many years. It causes wilting and dying of many different kinds of plants. Southern blight is more common in the South or can be in hot summer months. 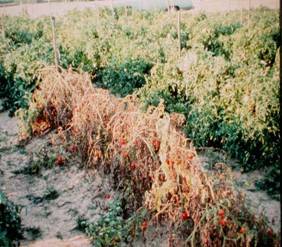 Tomato varieties have poor resistance to this disease. caused by the bacteria Pseudomonas solanacearum.Rapid, sudden wilting of the entire plant denotes this disease. Pith of the main stem near soil line is usually brown at first, but soon develops a slimy rot. Bacteria attack numerous other plants, especially in the Solanaceae (night shade) and legume families, and may live in soil for many years. 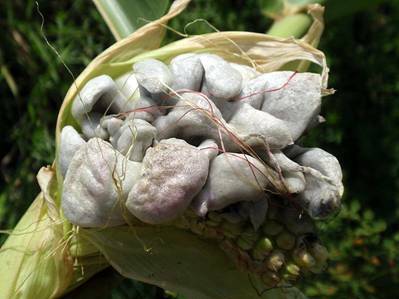 caused by the fungus Alternaria solani. 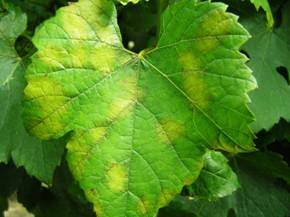 This disease usually begins on lower leaves and gradually spreads upward. Concentric rings (targetlike) that develop in leaf and stem spots are characteristic. The fungus may live in soils for 1 or 2 years. In addition, it is spread on transplants and by wind blown spores. It may appear on fruit, mainly as firm, dark-colored decay at stem end and dark spots on leaves. Caused by the fungus Stemphylium solani. 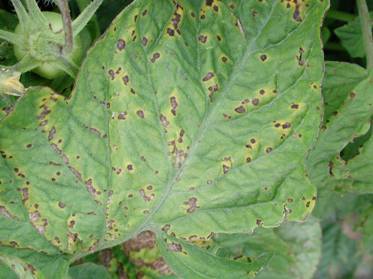 Characteristic symptom is numerous, rounded leaf spots, brown with gray centers, which are smaller than those of early blight. These spots often grow together to kill the entire leaf. The disease does not occur on the fruit. The fungus may live for 1 or 2 years in the soil. It can be spread on transplants and by wind blown spores. Caused by fungus Erysphe sp. 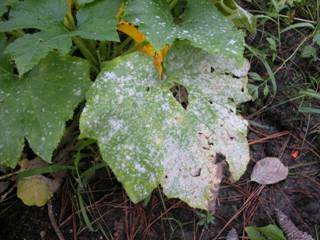 Many different plants are attacked by the powdery mildews, but in general each powdery mildew fungus is restricted to a few closely related host species. 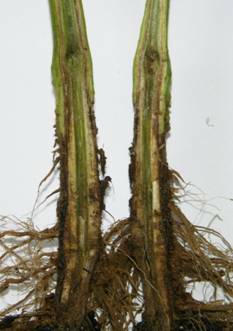 White, moldy growth mostly on upper leaf surface is characteristic. It does not usually develop on the fruit.The fungus is spread long distances by wind. Caused by the nematode Meloidogyne sp. 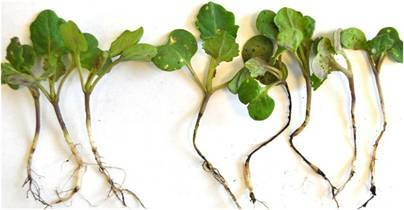 Distinguishing symptom is galls on roots. Affected plant becomes unthrifty, off-colored, stunted, and may eventually die. The greatest damage is likely to occur during dry periods. 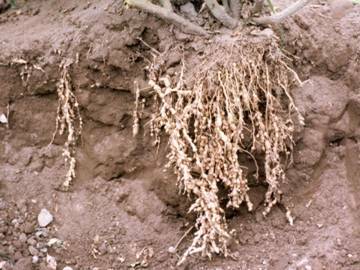 Root knot is common in both field and garden soils and attacks a wide variety of plants. Resistance is found in some crops. Control is mainly by soil fumigation and by cultural methods. Caused by the fungus Rhizoctonia solani. 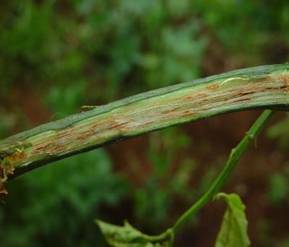 Characteristic symptom is reddish-brown lesions or rots on stem near or below the soil line. The entire root system may be rotted. Affected young bean plants appear stunted and off-colored, and may slowly die. Caused by several different genera and species of fungi.Distinguishing sign is the downy fungal growth on the underside of leaf spots in wet, humid weather, particularly in the early morning. Yellow spots first develop on upper side of the leaf. 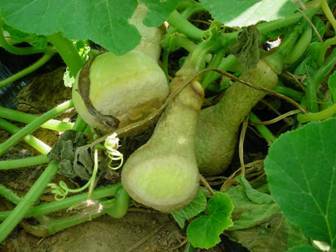 Caused by the fungus Choanephora cucurbitorum. Dense, black fuzzy mold on the surface of rotted fruit or flowers denotes this rot. It does not affect leaves and stems. 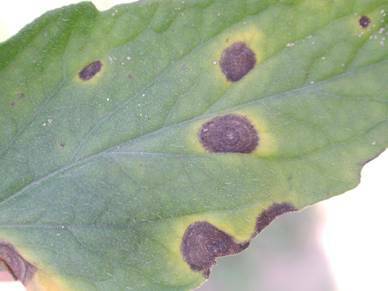 This disease is a problem primarily during periods or high humidity and on crowded vigorous plants.